William Parker, late of Easington Lane, Hetton, was a sturdy Northumbrian. He was born at Benton Square in the year 1818, and lived to the ripe age of 82 years. He came of excellent parentage – his father, by his devotion to piety, winning the homely and happy sobriquet – Pious Johnny Parker. William it would appear, proved quite impervious to all good influence until he reached the age of 24 years, when a deep conviction of sin laid hold of him. The struggle through which he passed into the peace of Christ was no ordinary one, but his conversion was a triumph of grace, destined to bear beautiful blessing to hundreds of lives in the second half of the nineteenth century. Bro. Parker soon became a local preacher, and for upwards of fifty years devoted all his powers to the preaching of the gospel. In this work he simply excelled. He invariably wrestled in prayer until he felt God had given him the message: in this he anticipated, almost to the letter, Dr. Horton’s advice in “Verbum Dei.” As a preacher he was emotional and evangelical. Beyond doubt he was used of God in a most extraordinary measure for the conversion of souls – for a number of years men were saved at every service he conducted. His influence on his family has resulted in much benefit to the church- his son John being an evangelist who is well-known and much used throughout the churches of the North, whilst most of his grandchildren are faithfully serving the church. His old age was spent happily in the home of his daughter, from which he passed suddenly away on the Sabbath morning – February 18th – in the last year of the century. William worked as a coal miner. 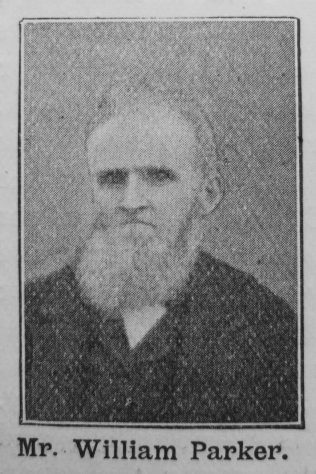 He married Mary Ould (or Auld) (1820-1886) on 1 June 1839 at Tynemouth, Northumberland. Census returns identify three children. William died on 18 February 1900.